It is 1937 and Andras Levi, a Hungarian Jewish Architect arrives in Paris with a single suitcase and a mysterious letter that he is to deliver to C. Morgenstern on the rue de Sévigné. The Invisible Bridge follows Andras , as well as his family as World War II sweeps across Europe, changing everyone’s lives forever. 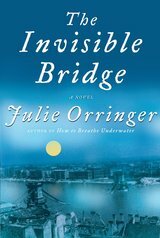 Please join us in reading The Invisible Bridge.